IshitaUnblogged blog is text-heavy. I have been toying with an idea of another blog for a long time that will help me to shut my thoughts up – in terms of writing and bringing up all the photos of Dubai that I am incessantly clicking. And yes, while jumping into the new bandwagon, that is called Instagram! DubaiUnblogged, my second baby, unravels Dubai through images and photographs. It will feature lots of hidden gems of Dubai that are crying out loud for attention. Lots of ideas are there and according to many, introducing the blog with only 4 posts is unwise. But I like ‘growing up and growing old’ together with my readers. It has been the case with IshitaUnblogged. And I’m sure it’s going to be the same with my new blog. Not asking you guys to hop over – this post is a glimpse of what the other blog is going to look like. There will be no text there, I assure you. Meena Bazaar at night… cars, cycles, pedestrians, clothes, shoes, jewellery, food – all shout out loud and simultaneously for attention! 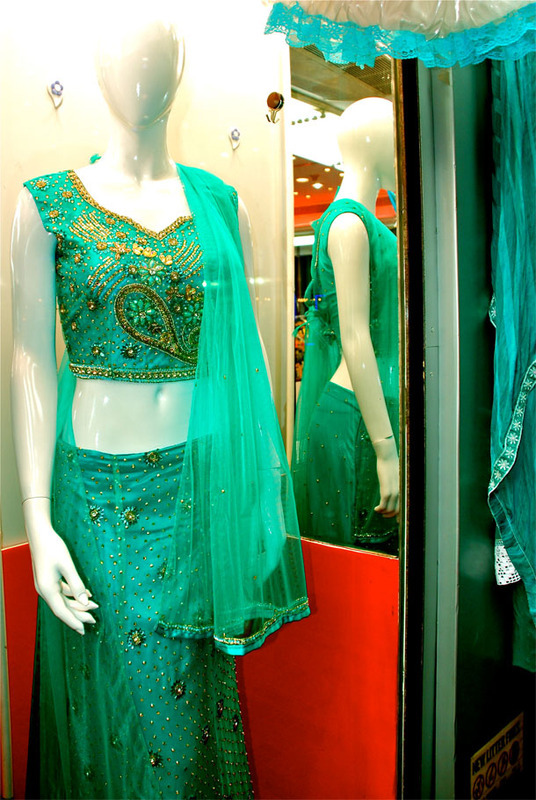 Contrary to the glitzy shopping malls in Dubai, Meena Bazaar has a different charm altogether. From glaring lights to the blaring horns from cars struck in the perennial traffic, from the snaky lanes and by-lanes to the crowded main-road, from Indian and Pakistani stores selling traditional clothings to Iranian spice shops, from haute-couture fashion Boutiques (selling mainly traditional Indian and Pakistani ethnic attire) to stores selling high-street fashion, branded watch-houses to shops – the ’10 Dirhams shops’ selling inexpensive models of electronics to home products, from computers to spare-parts, from quick-fixers like cobblers and menders to expensive tailoring shops – I love Meena Bazaar. Specially, when the narrow dark alleys suddenly open up and you are hit with the bright sunlight and the sparkling sea-green waters of the Dubai Creek! Did I say sunlight? Oops, mistake – this post is about Meena Bazaar at night! History of Meena Bazaar: Traditionally, Meena Bazaars were special Bazaars/markets organised to sell items to raise money for non-profit organizations. During the Mughal era, Meena Bazaars were exclusively held inside the palace courtyards resembling a Bazaar for the women of the Royal courts who were not allowed to go out to shop. Dubai Meena Bazaar: Originally known as Cosmos lane, it is interesting to note how this area acquired the name Meena Bazaar. According to an article in the Gulf News – the residents and the taxi drivers started calling the area Meena Bazaar because of the decorated mannequins lining the shops just like in India and Pakistan. A visit to the Meena Bazaar at night is a must. You’ll be blinded by it’s glitter. One word of caution – Please plan to walk. Driving into a crowded Meena Bazaar can be worse than a nightmare. This is just adjacent to the Dubai Museum and the Bastakiya quarters and you may walk along 50B Street near Dubai Museum or approach the area from Khalid Bin Walid Street/Bank Street in Bur Dubai. Disclaimer: I hope you enjoy reading the posts with lots of visuals, some of which have been taken from our personal albums just to make your reading experience more pleasurable. You can see more pictures of my travel and food journey here. ← Tantuni in JLT | A Taste Of Turkish Street Food And Another Blog Giveaway! My mum told me it was called Meena Bazaar because the first shop in the lane was Meena Textiles. And that shop isn’t even around anymore! The corner shop on the lane was called Meena textiles – at that time (late 70s) it was the only big shop in that lane, so that’s how the name stuck! Nothing official, just the stories mum and dad shared with me. Yeah… I think even when we had come to Dubai – in 1999, it was called the Cosmos lane as well. Very interesting addition from a reader – apparaently there was a big textiles shop called Meena Textiles! Thank you Sally, I plan to. Instagram is pretty fun! Congrats on the new space. Never been to Dubai but the pics look awesome. love it !!!!! want more…….. Need some help to get here. If I was located at Al Ghurair Centre what will be my best route to get to the bazaar? Few times I have visited Dubai, a magical world. Two times I have stayed in my close friends flat at Meena bazar. It of course crowded with textiles, hotels, other shops etc. It resembles certain place in Delhi or North India since most of the Textile shops are covered with the exhibits such as chudidars , Kurthis sarees etc. It is a nice place and a tourist should visit Meena Bazar.